THE TRICK-OR-TREATERS, all eight of them, have come and gone. The candy bowl remains filled with plenty of chocolate for a day or two of snacking. I’ve switched off the front entry light and locked the door on another Halloween. I hopes yours, like mine, was sweetened by candy and brightened by the wide smiles of jack-o-lanterns and of happy, happy kids. 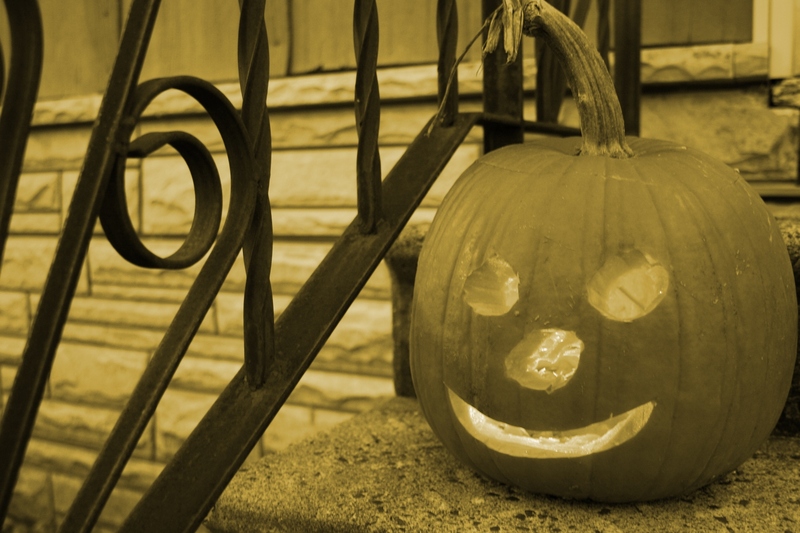 I edited my jack-o-lantern photo just because, well, it’s Halloween. This is version one. Rather plain, huh? Continue scrolling down to the next image. So…I added color. I’ve always loved lime green. The real jack-o-lantern, no photo editing involved. I LOVE MY EXTENDED family, even when they continue, for decades, to haunt and taunt me. Now, they will never admit it, but I determined long ago that my Aunt Marilyn, and now her daughter Dawn, are the perpetrators, the instigators, the whatever-you-want-to-call-them, behind a Halloween tradition. You see, for years I’ve received a Halloween card from the ghost of Annie Mary Twente, a 6-year-old who fell into a coma and was buried alive in Albin Township near Hanska in 1886. Legend goes that Annie’s father had his daughter’s body exhumed and found scratch marks inside the girl’s coffin where she tried to claw her way out. That tale is enough to scare anyone. For some reason, I once told my aunt that I detested this macabre story. I think that was around the time I lived and worked as a newspaper reporter in St. James, near Hanska. She’s never forgotten. I have no clue how long Marilyn searches for the perfect Halloween card. But she always manages to come up with an appropriate greeting befitting of Annie Mary. Because of copyright laws, I can’t quote card verses here. But the image on the front of this year’s card (the one from Marilyn) shows two glowing jack-o-lanterns atop a fence in the diminishing light of early evening. As I study the photo, I am reminded of the fence that surrounded Annie’s grave. (Her remains have since been moved to the Alexandria area.) Spooky. As varied as the cards are each year, I can always be assured that Marilyn/Annie will pen the same message in her childish block print: “I MISS YOU! ANNIE MARY.” Clearly, at six, she never learned cursive. As if one Halloween card from the little ghost girl isn’t enough, for the first time this year, I received a second greeting. That arrived this morning with a nice little message that Annie Mary is thinking of me. How thoughtful. 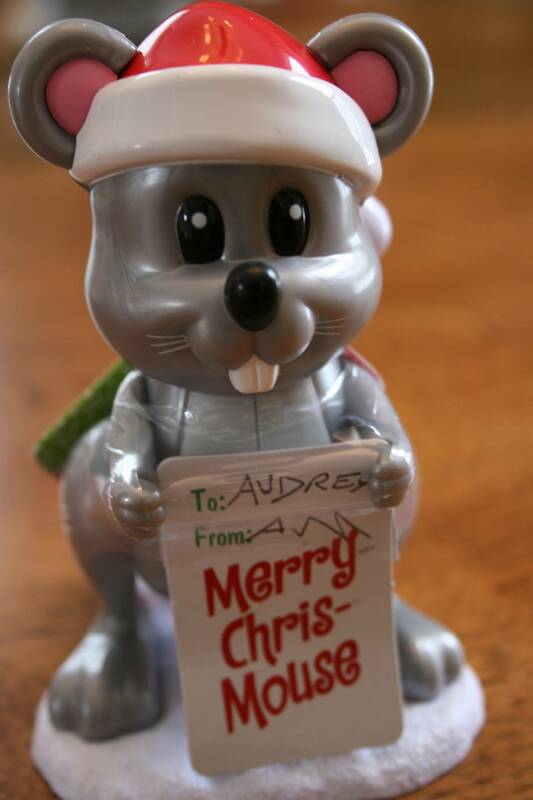 Annie Mary sent me this mouse last Christmas. For gosh sakes, I didn’t need Annie Mary knowing that I hate mice. But, somehow, she learned this invaluable information. Just last week an unexpected package arrived from AM (Annie Mary). Honestly, I was afraid to open the darned thing. So I pushed and prodded, suspected a mouse trap, peeked quickly inside and then threw the envelope at my second-born. She pulled out two tiny sticky gray rubber mice, a flashing skeleton head pin and CHUCKLES candy. Ha. Ha. Very funny, cousin Dawn, uh, I mean Annie Mary. I did not welcome this Halloween gift from Annie Mary. I suppose you’re wondering why I dislike mice so much. Let’s see. Would a mouse cavorting in the silverware drawer or floating in a crockpot spook you? Or how about getting stuck in your in-laws’ bathroom with a mouse in the dead of night when you’re six months pregnant? Yes, all three horrible mouse encounters happened to me. 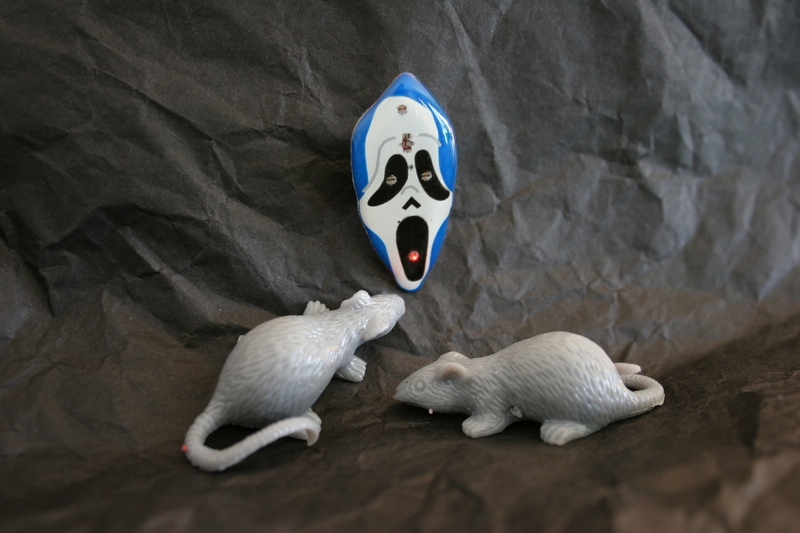 With enough living (and dead) mice in my life, I certainly don’t need Annie Mary mailing replicas to remind me of all that real-life mouse horror. Oh, and I haven’t even told you that the ghost child blemished Valentine’s Day last year by sending me not one, but two, valentine cards. 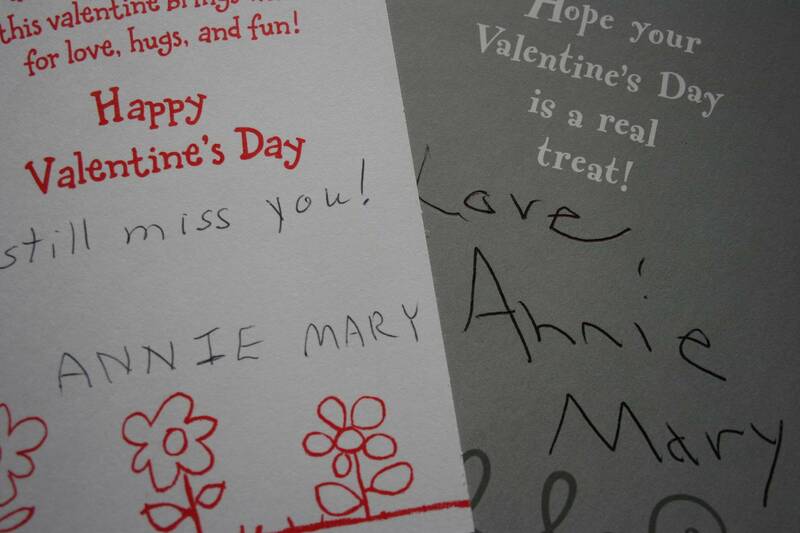 Valentine greetings from Annie Mary. Which is authentic? So…, I’m wondering if you had relatives like mine, who feign innocence about any and all communications from Annie Mary Twente, what would you do? Would you still claim them as your family members? Or…, would you try somehow to get even? NOW, HONESTLY, tell me. 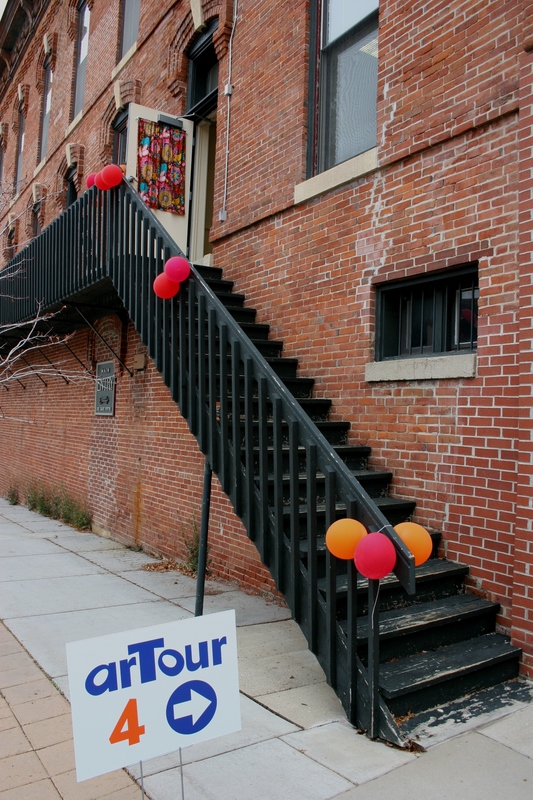 If you were walking down the sidewalk, saw this sign, these stairs clinging to this brick building and this wide-open welcoming door, wouldn’t you race up the steps? This stairway leads to Nancy Carlson's art studio in downtown Northfield. I didn’t race, but I hurried, after I’d snapped a few photos of this appealing scene in downtown Northfield. Never mind that my husband and second daughter thought me somewhat crazy. But, unlike them, I typically carry a camera on my hip and see photo ops in places most people wouldn’t. Besides, the cloth on this door reminded me of the 70s, my era, and all the years I stitched clothing from psychedelic fabrics. 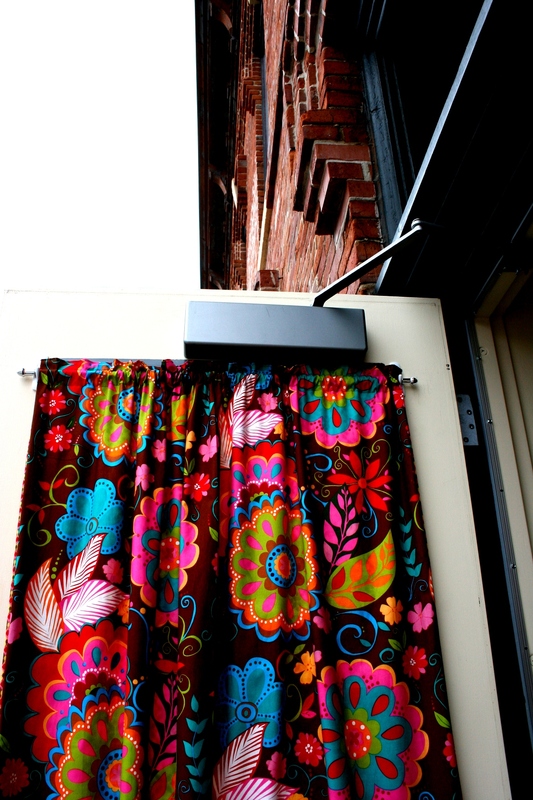 This fabric on the studio door takes me back to the 70s. Inside, more bright colors awaited me. 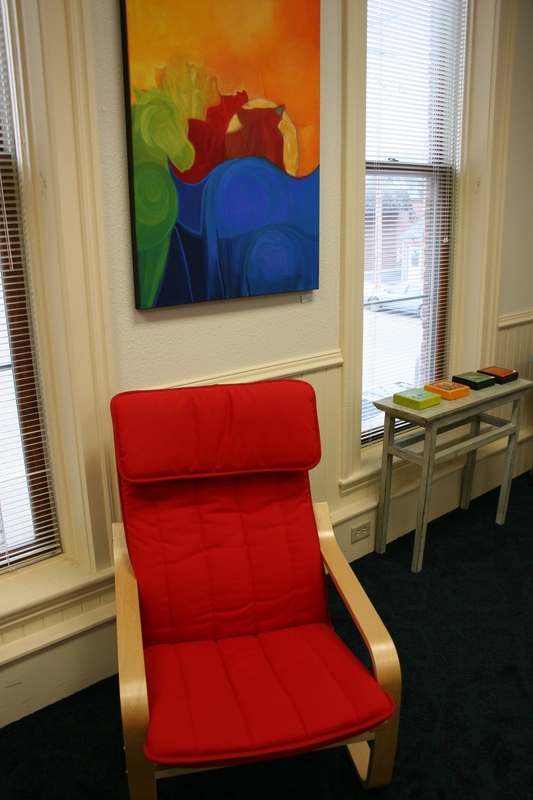 Just look at this bold chair and equally bold artwork. Freelance painter and mixed media artist Carla Thompson of Barefoot Studio created the vivid horse painting. A perfect pairing of bold art and a bold chair inside the studio. She’s in to bright colors and whimsy and I took a fancy to her wood block paintings. Visual art paired with words—humor and simple thoughts on life, according to information from her Web site. 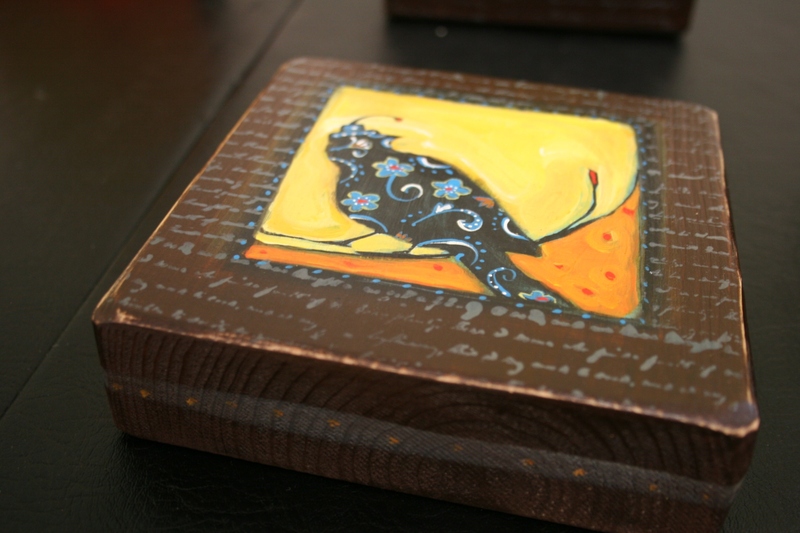 Whimsical designs painted on wood blocks by Carla Thompson and photographed, by me, at a weird, artsy angle. 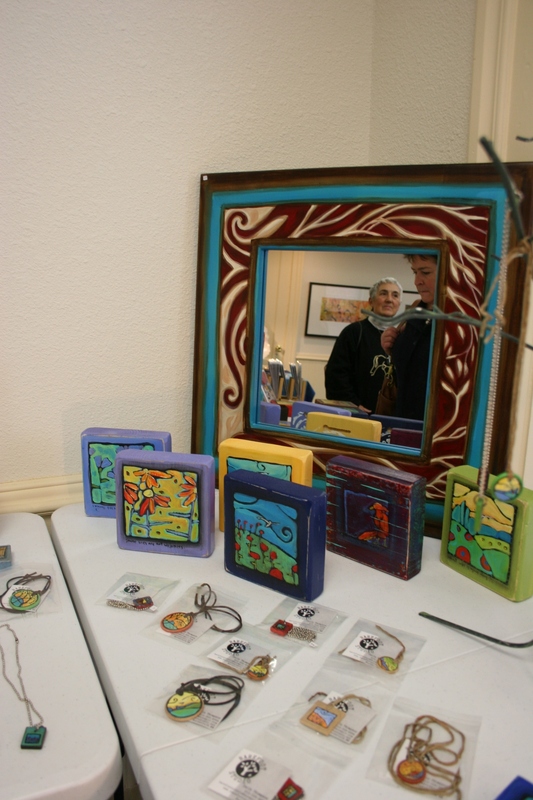 Mirror art by Carla Thompson frames visitors perusing her art during last weekend's Studio arTour. Artists Meg Jensen Witt and Nancy Carlson joined Thompson in displaying their art in Carlson’s studio during last weekend’s South Central Minnesota October Studio arTour and Sale. 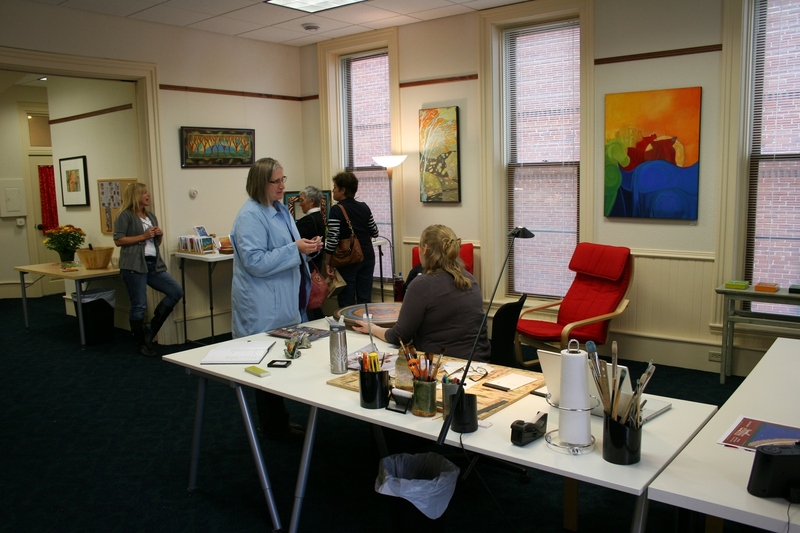 Carlson, in my opinion, has a pretty cool place, in the McClaughry Building, 101 E. Fifth Street, to hang out and create her watercolor and India ink pieces. 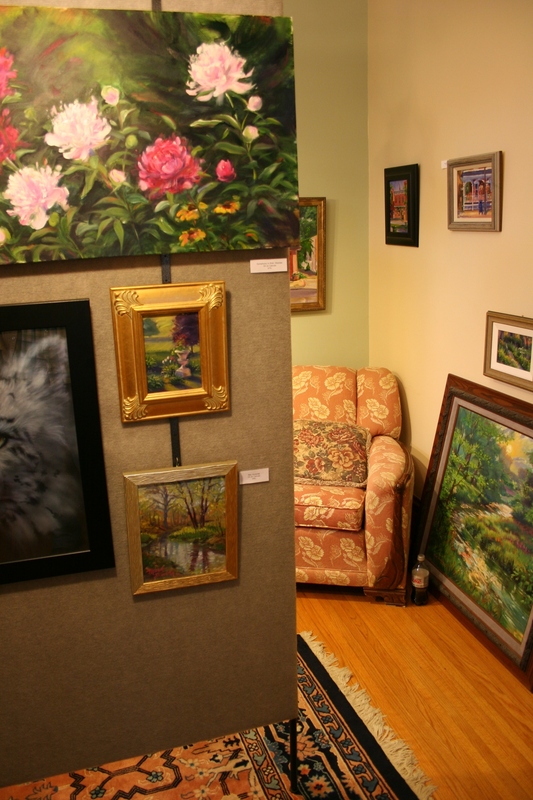 An overview of Nancy Carlson's art studio in the McClaughry Building, 101 E. Fifth Street, Suite 211, Northfield, during the arTour last weekend. Witt’s ceramic wall hangings and table top pottery, in mostly subdued, muted tones, contrasted sharply with the bolder art of her friends. 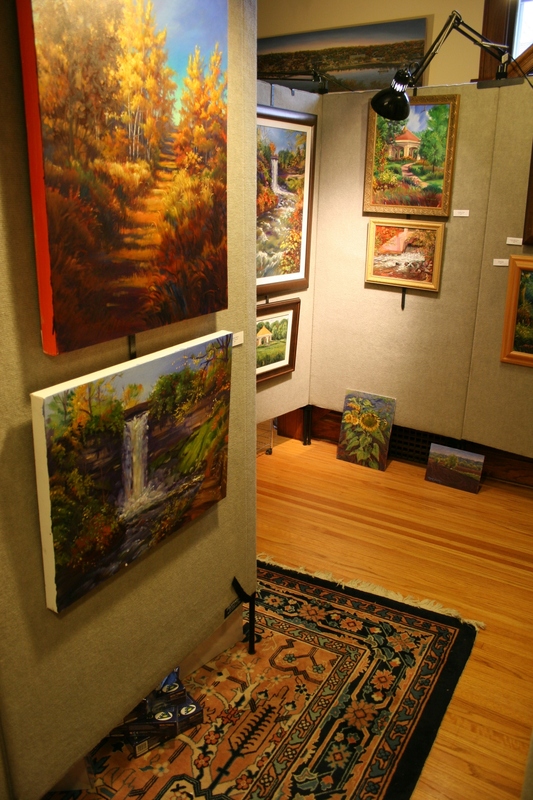 Examples of Meg Jensen Witt's nature-themed art. But that’s the great thing about art. We all have different tastes. Exactly what we like depends on many factors—for me, my rural upbringing and that 70s influence. ON THE FRIDAY AFTERNOON I met Joshua Colonna, he was working on a “honey-do” list. He and Melissa are expecting their first child in November and she wanted him to finish a few tasks. 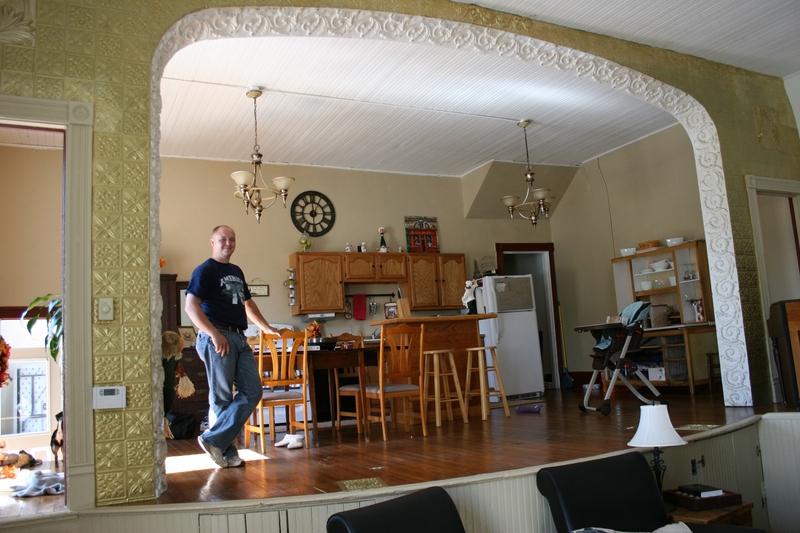 But that didn’t stop this hospitable young man from pausing in his home improvement projects to invite me and my husband inside the couple’s Kasota home. And what a home. 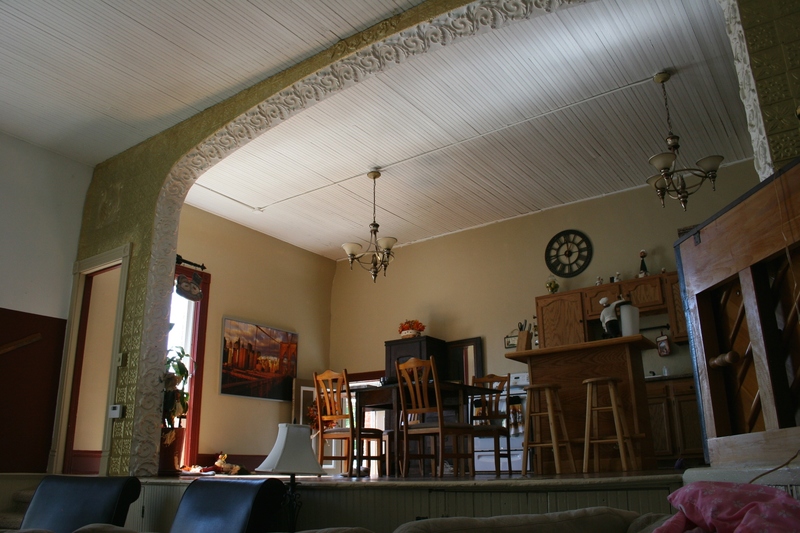 The pair live in an apartment in the 1898 former Kasota City Hall. 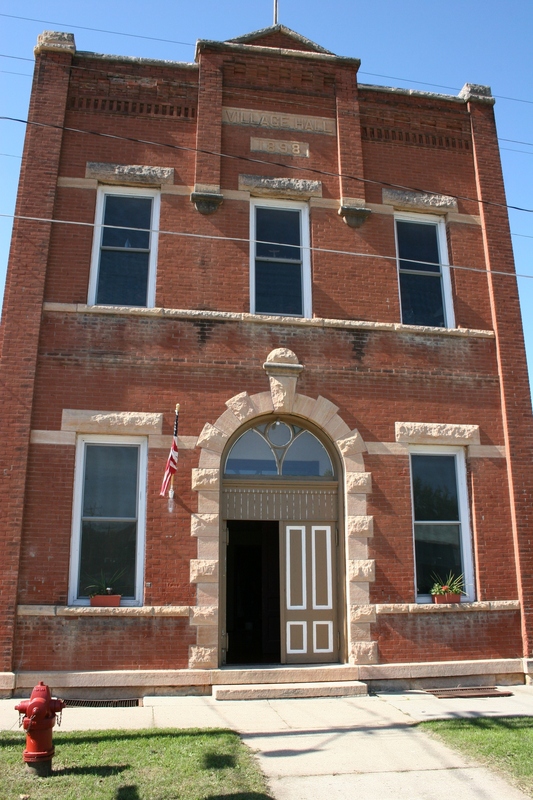 The 1898 Kasota City Hall, now a 5-unit apartment building. An open front door initially drew me toward the corner brick building in the heart of this small river town. I loitered outside the old hall snapping exterior photos and contemplating shots of an interior construction zone. But when I asked a workman if I could take pictures, he deferred to Joshua, who turned down my request. Just as quickly, though, Joshua offered us an impromptu tour of his apartment, apologizing that the place was a bit of a mess due to his in-progess projects. 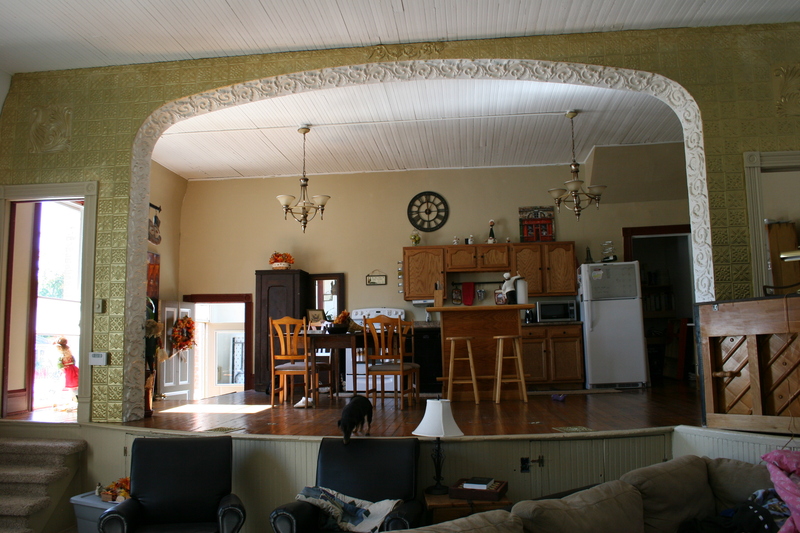 To my absolute delight, I walked through a side door, up several steps and onto a stage-turned-kitchen. As corny as this sounds, how cool is that? I just stood there for a minute on the old hardwood floor, totally awed that someone would have an apartment as dramatically-inspiring as this one. The stage area has been transformed into a kitchen. With a beadboard ceiling, decorative painted metal framing the stage, and antique furniture mixed with modern, the stage is set for a classy, airy apartment with a vintage feel. This place possesses flair, pizzazz and drama. 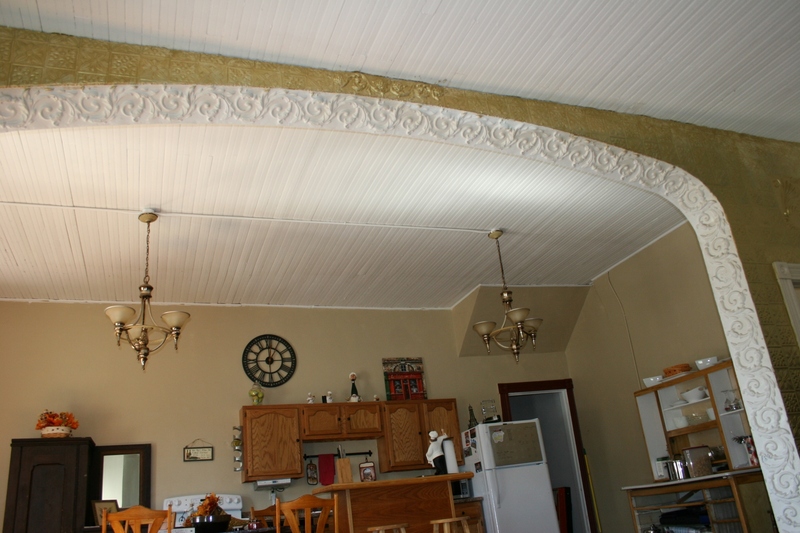 Original decorative trim surrounds the stage which features a beadboard ceiling. All the world's a stage, or in this case the stage is a kitchen. Here's Joshua on stage. I can see why someone, anyone, would want to live here. 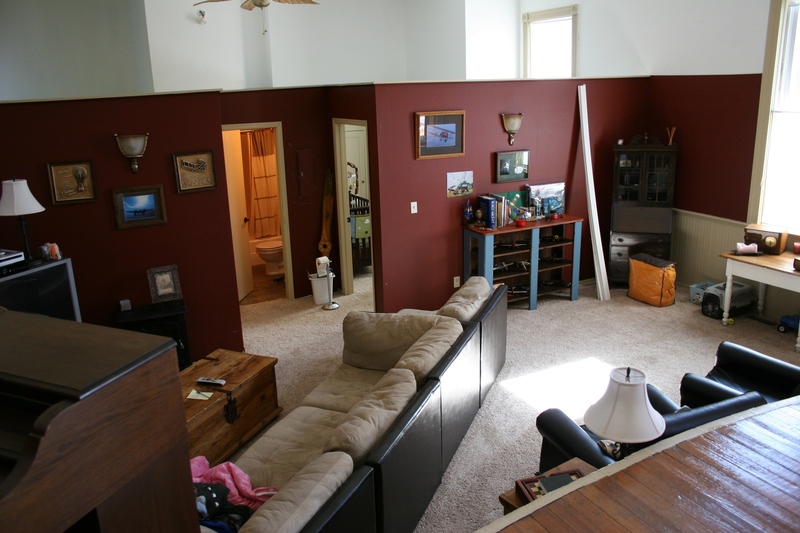 What fun to have get-togethers here, mingling on the kitchen/stage and in the audience area below, now partitioned into a living room, two bedrooms and a bathroom in this apartment. 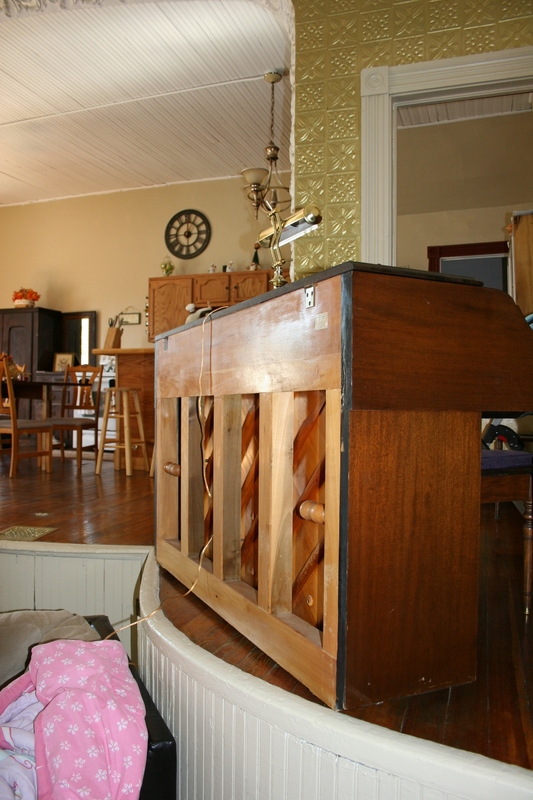 And then the real kicker, on the side stage extension that veers into a corner of the living room rests Melissa’s piano, perfect for entertaining. A stage bump-out presents the perfect place for a piano. The stage looks onto the revamped audience seating area which has been partitioned into a living room, two bedrooms and a bathroom. Only the bathroom has a separate, lowered ceiling over it. One last angle of that dramatic, inspiring kitchen. 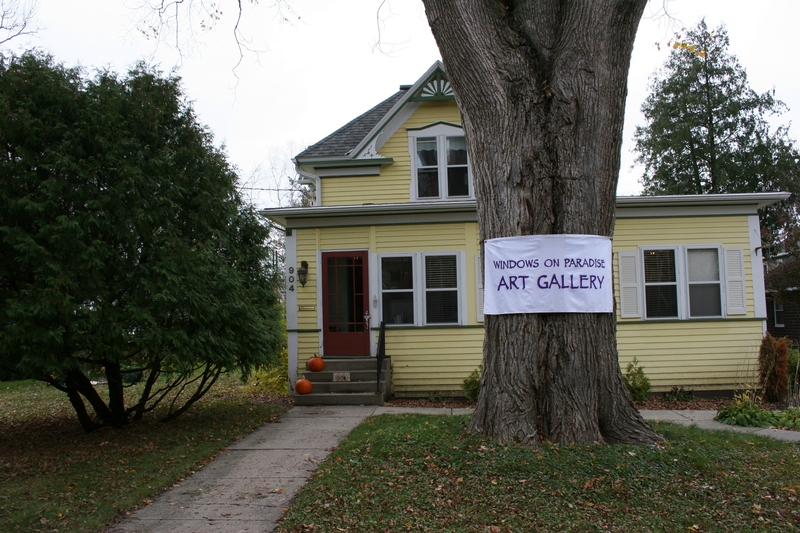 Windows on Paradise Art Gallery, 904 Division Street South, Northfield. IF NOT FOR THE EXTERIOR sign attached to a front yard tree, the pale yellow house set back from the Division Street sidewalk could pass for just another residence. Instead, this old house is home, studio and gallery to nationally-known Northfield artist Mark Daehlin, one of 29 artists featured on this past weekend’s South Central Minnesota October Studio ArTour and Sale. I entered the Windows on Paradise Art Gallery via an inviting front porch where some of Daehlin’s work was displayed. The artist, who does primarily oils, asked that I not single out pieces to photograph, so I’ll simply tell you that my husband and I lingered by Daehlin’s realistic depiction of an old John Deere tractor in a rural scene. It was a bit of a game for us to find the pheasant roosters incorporated into the work. Even more interesting, I learned that Daehlin’s paintings have been made into puzzles. Now I am not a puzzle person—I actually get quite frustrated with puzzles—but even I can appreciate the beauty of a fine art puzzle. With outdoor scenes like “Majestic Moose” and “Opening Day” offered by White Mountain Puzzles and “Lakeside Cabin” and “Indian Summer” (among others) from Bits And Pieces Puzzles, these puzzles should hold a special appeal for outdoors-loving Minnesotans. 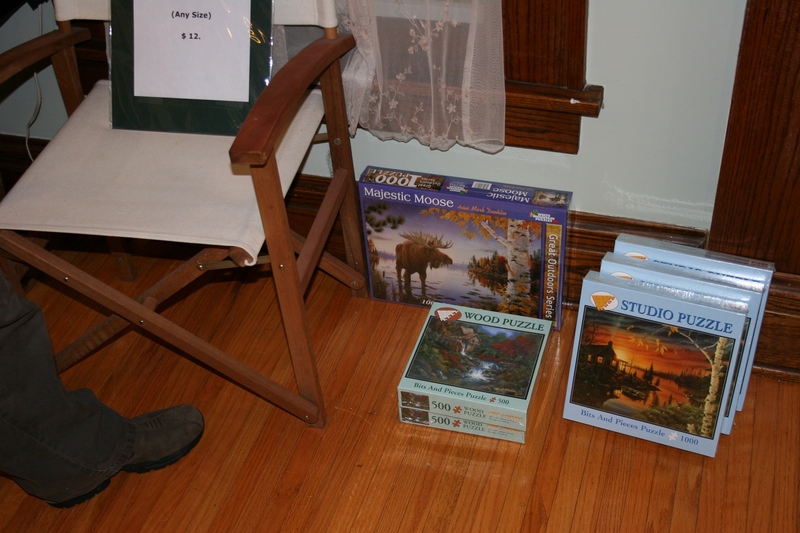 Puzzles featuring Mark Daehlin's art were propped on the floor in his gallery during the studio tour. 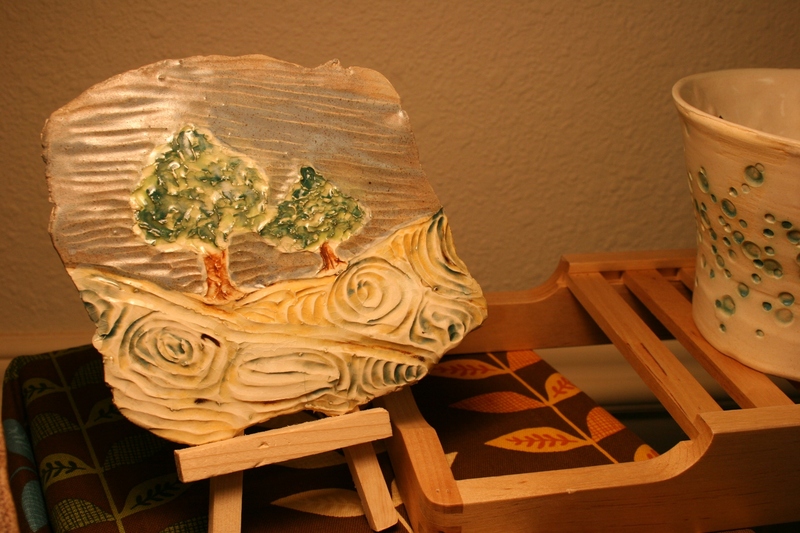 All of Daehlin’s art, really, showcases nature. From waterfalls to fall scenes, sunflowers, peonies, winterscapes and lots more, these paintings reflect the artist’s ability to truly see, in detail, the world around him. 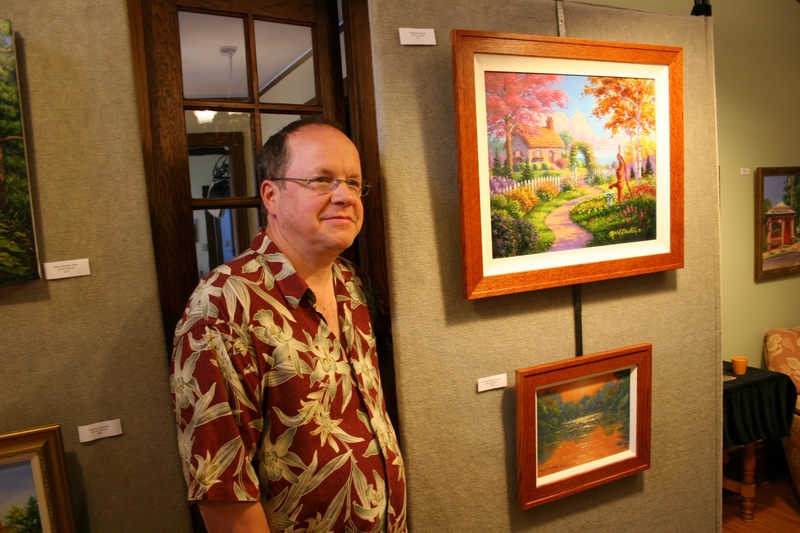 Northfield artist Mark Daehlin and some of his art, in his gallery. I was particularly impressed with his 12 x 48-inch “Stillwater Nights” painting that features a riverside view of Stillwater. Here’s Daehlin’s description from his Web site: “After the sun sets over Stillwater, streetlights come on, bathing the town in a romantic glow. A cruising riverboat is reflected in flowing waters. It’s the height of autumn and trees are ablaze in all their finery.” It’s a splendid piece of art that makes you want to hop in the car and cross the Stillwater lift bridge to view the city as Daehlin has through his artist’s eyes. 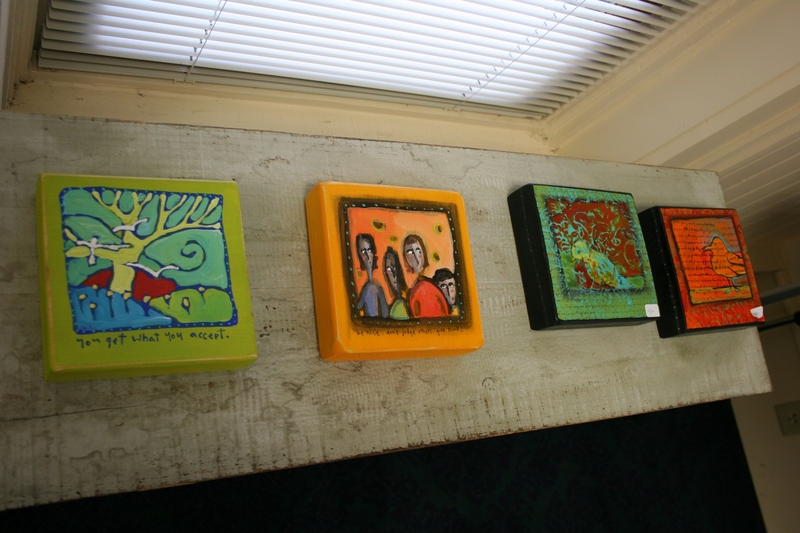 Daehlin's art is displayed in his house, in a room-turned-gallery. At the top of this photo, you'll see a portion of his "Stillwater Nights" painting. Warm wood floors, a strategically-placed area rug and a plump chair create an inviting gallery space. 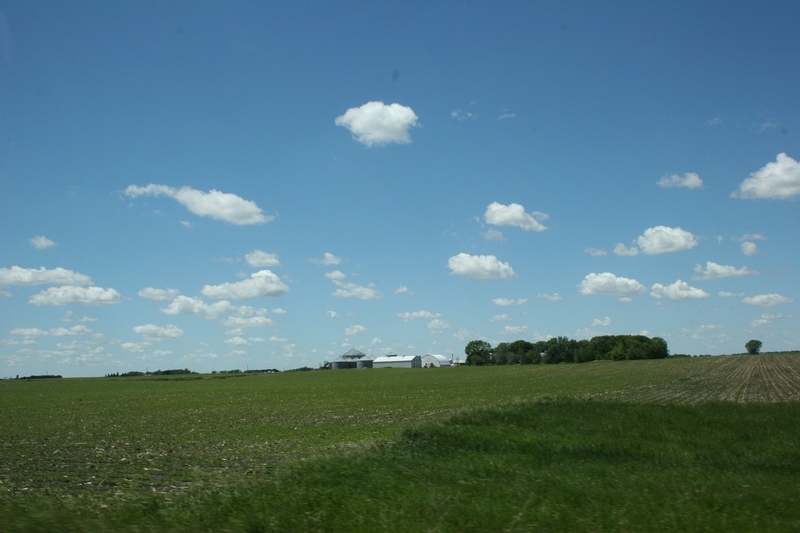 Redwood County farmland only miles from my hometown of Vesta. This photo was taken last spring. ABOUT MID-MORNING TODAY, an e-mail popped into my in-box. “Windy greetings” the subject line read. I clicked. She didn’t explain how nasty, but I can about guess. Dawn lives in Redwood County, smack dab in the middle of the Minnesota prairie—the place of endless fields, wide open spaces and few trees to break the unrelenting wind. 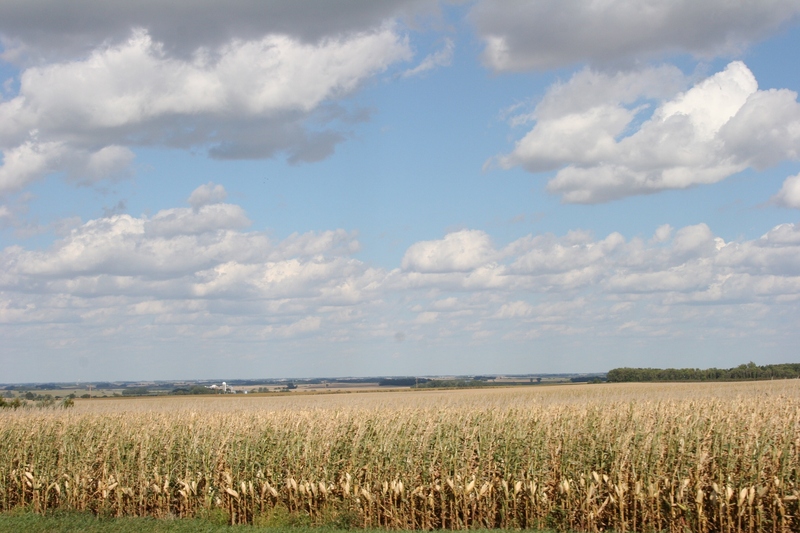 Big skies, wide open spaces and wind are a part of the landscape in southwestern Minnesota, where I shot this cornfield image about two months ago. And today, from all I’ve read and heard, those winds will blow strong and sustained at 30 – 40 mph, sometimes reaching gusts of 60 mph. Dawn’s right. That’s downright nasty. And scary. I speak from experience. This past summer I was caught, along with three family members, for 45 minutes in a car in a night-time thunderstorm that packed 70 mph winds. We were on unfamiliar Redwood County Road 5 between Walnut Grove and my hometown of Vesta when the storm hit. I have never been more frightened in my life. Torrential rain in pitch black darkness pierced periodically by jagged lightning. Winds buffeting and rocking the car, flattening roadside grasses to the gravel shoulders. No radio. No cell phone service. No way of knowing where we were, what lay ahead of us, when the storm would end. That July night I pressed my head against the back of the car seat in prayer. My 78-year-old mom kept telling us we were in the safest place we could be although I didn’t believe her for a second and I told her so. But I suppose it’s just natural for a mother to comfort her child, even if that daughter is in her 50s. So…, when you start talking wind, strong wind, I listen. As I look out of my office window now I see the tops of the trees dancing against the backdrop of a dismal, gray sky. Rain is falling. My neighbor’s slender, house-hugging shrubs are swaying, too, and the few leaves left on trees are twisting and turning and spiraling to the earth. Yet, because I live in a valley in Faribault, in the city, I certainly am not seeing the full power of the wind like my cousin out on the wind-swept prairie some 100 miles away. My advice to Dawn (who also rode out that July storm in a vehicle) would be this: Do not travel. And, if you must attend your son’s football game tonight, pull on the winter coat, cap and mittens, and anchor yourself to the bleachers. 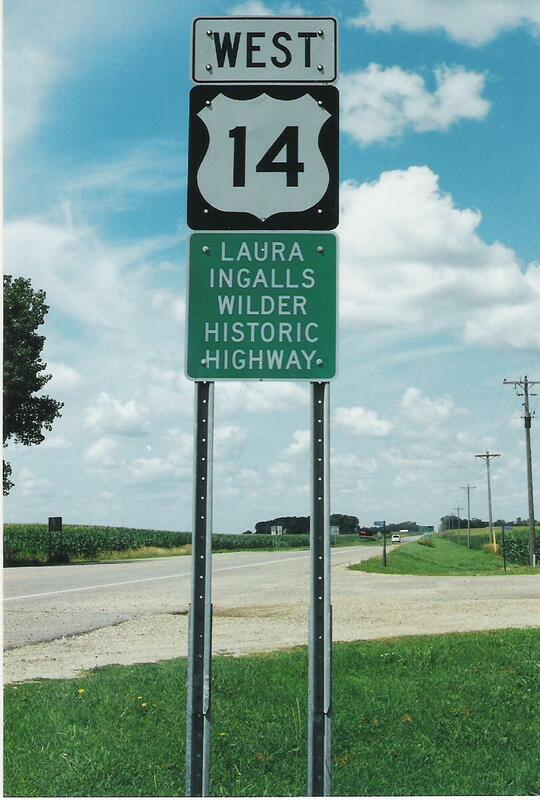 U.S. Highway 14 slices through the heart of southwestern Minnesota. I wouldn't advise travel if winds reach 60 - 70 mph. I took this photo several years ago during the summer. READERS, IF YOU have a weather report to share, please submit a comment to Minnesota Prairie Roots. You know how we Minnesotans are—always obsessed with the weather. WHEN I WAS A CHILD, I loved the story about The Three Billy Goats Gruff. Do you remember that tale of the three goats planning to cross a bridge, but first encountering a hungry troll? The goats, beginning with the smallest, tricked the troll into waiting for the next, and bigger, goat. The third, and largest, goat was so big that he easily tossed the troll into oblivion and safely crossed the bridge. I’m not sure why I enjoyed that tale so much. Maybe because I owned that storybook and my mom read and reread the words until I had them memorized. Or maybe I just appreciated that three goats could outsmart a mean old troll. Anyway, because of that childhood literary introduction to goats, I’ve always rather enjoyed these mischievous animals. I find them humorous and cute and naughty all at the same time. 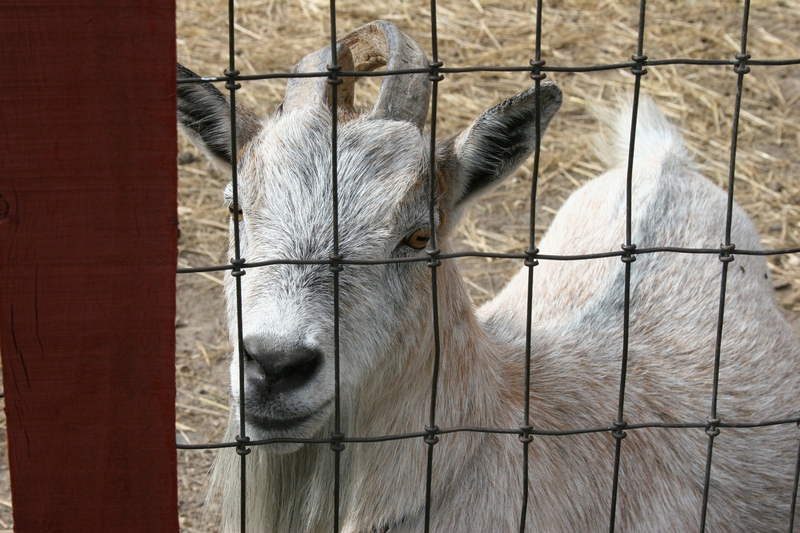 So, when I saw a bunch of goats fenced in at the Kasota Zoo several weeks ago, I had to investigate. Believe me, this is unlike any zoo you’ve ever seen. Propped pallets and a hodge podge of fences corral the 32 pygmy goats at this roadside oddity on the southern edge of Kasota. 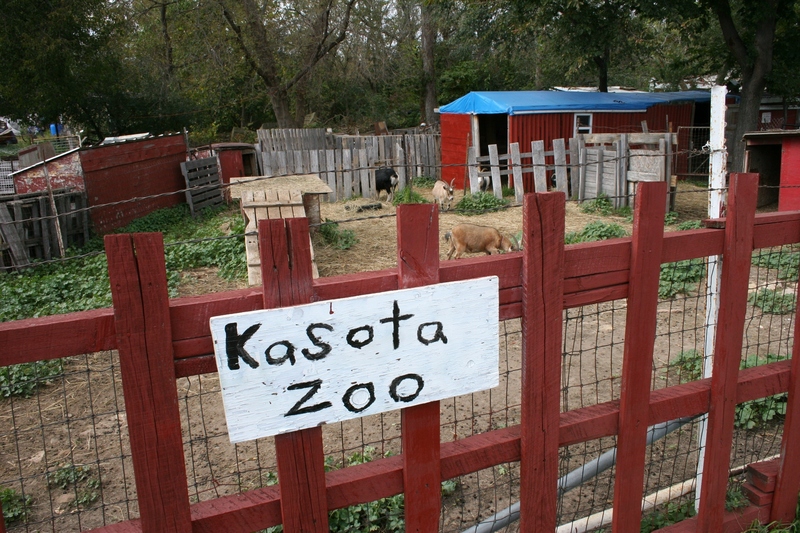 The Kasota Zoo, home to 32 pygmy goats. 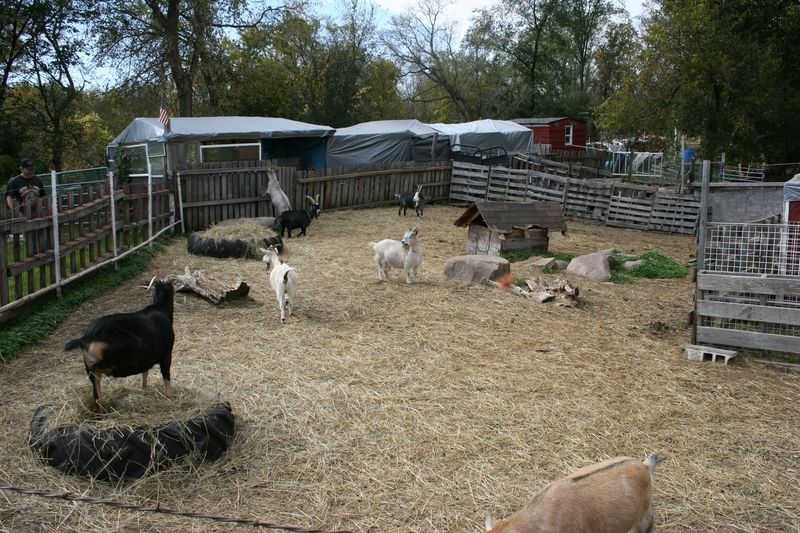 The goats have plenty of space to roam at the Kasota Zoo. 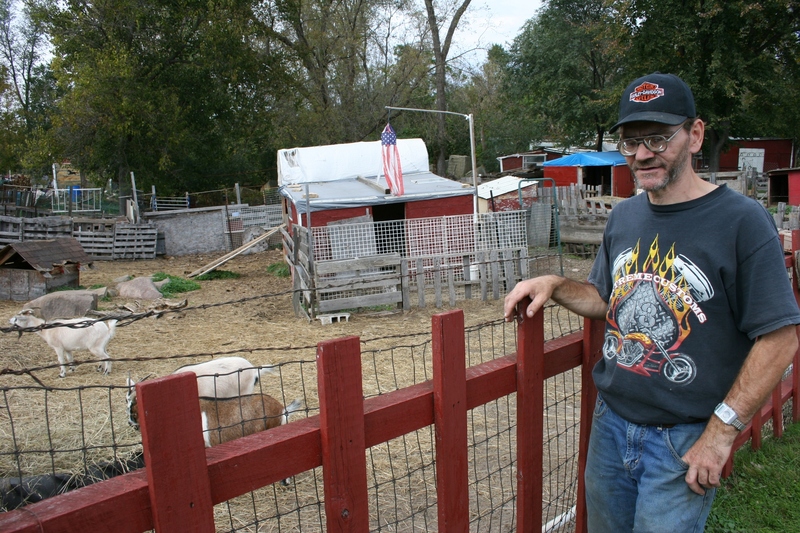 Toss in rocks and old tires, a bunch of shacks (some covered with tarps) and a few American flags and you have, by far, the strangest, weirdest, oddest, most unusual zoo I have ever visited. 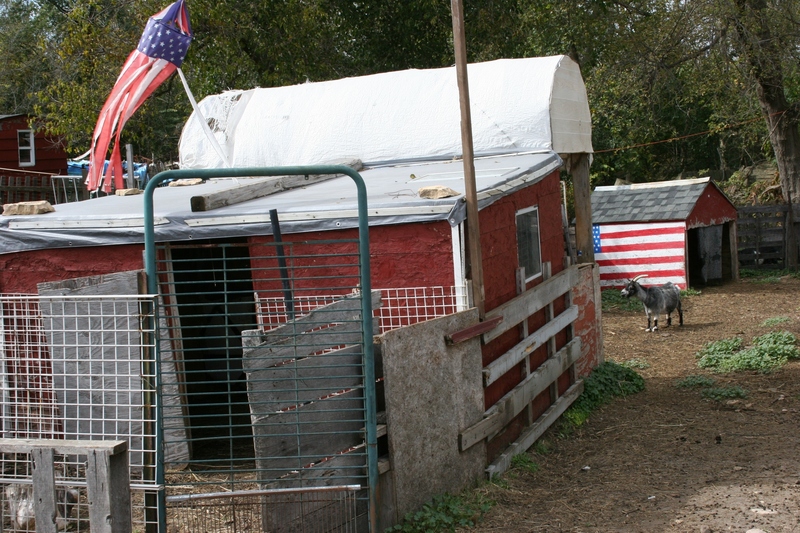 American flag decor adds a patriotic flair to this down-home zoo. I really question whether this even qualifies as a zoo given I paid no admission and saw no pathways that would take me beyond standing next to the fence watching the goats. That’s when zookeeper Eugene joined me. I have no idea where he appeared from, but, all of a sudden, there he was. His co-zookeeper, girlfriend Patty, was hunkered down in a lawn chair on the zoo driveway. I didn’t learn too much from Eugene. He’s not the most talkative fellow. But you can tell he genuinely cares for these goats, which are rotund enough to have eaten a troll or two. His zoo has been here 30-plus years, he says. He grew up with goats; his dad had milk goats. But Eugene and Patty raise and care for pygmy goats, which they’ll sell to anyone who wants one. “Do you have names for all of them?” I ask Eugene. “That one’s Number 8,” he says, pointing, while I struggle to keep from laughing that a goat would be named Number 8. But then he picks out Spot and Chucky. That’s more like it, I think—name-names for these inquisitive creatures that have scooted up to the fence to see me. Eugene and Patty have named all their goats, although I can't tell you the name of this one. I don’t spend much more time at the Kasota Zoo, just enough for Eugene to tell me that he has a visual impairment and that Patty is legally blind. Eugene, the zookeeper at the Kasota Zoo, wears thick glasses, but still struggles to see. I don’t mention a word about trolls to these zookeepers. Not a single word.